So as I start off yet another semester of grad school and classes and suchlike, I thought it might serve me well to do a general reading about it - what too keep in mind, look out for, etc. 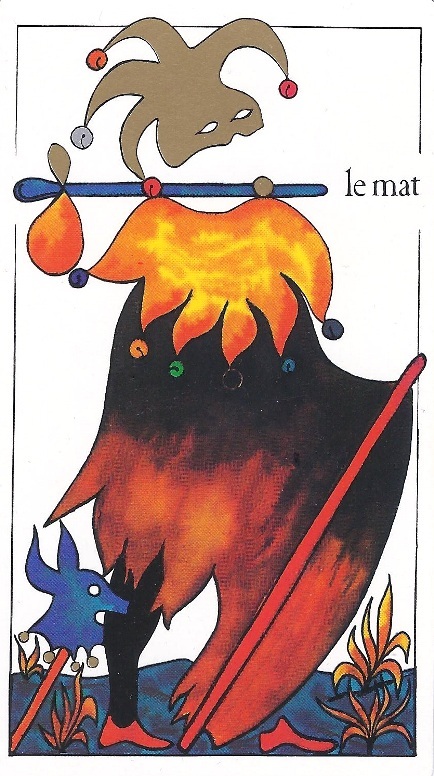 Once again I am using my de la Rea tarot and the Comte de Mellet spread. This time, I got quite a few more pairs, and in reading them, a pattern kind of emerged: Major = Theme, Minor = Details. In the first pair we have the Devil, wonderfully illustrated here by the particular shapes of these masks (the gold paint really does look much nicer in real life) as well as the smoky effect in the background. In this pair, starting off the reading, we can see a kind of question: what is lost likely to hold me back, tie me down, limit me, take away my attention from the things I should be focusing on? 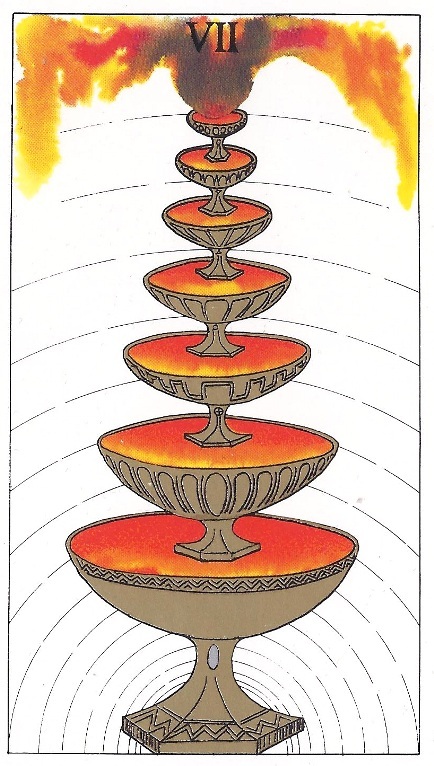 In the minor, the five of cups, we can find that answer. 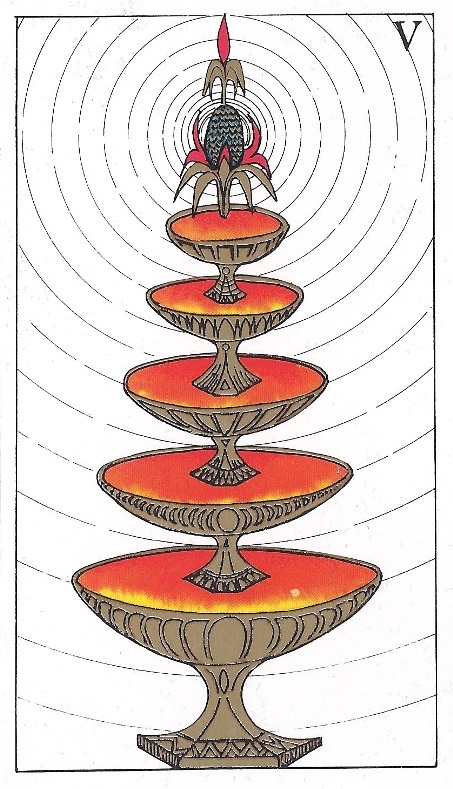 In the Thoth, which this card reminds me of more strongly due to the colors (there too, we have the kind of bright orange-red, as the background), this card is called Disappointment. 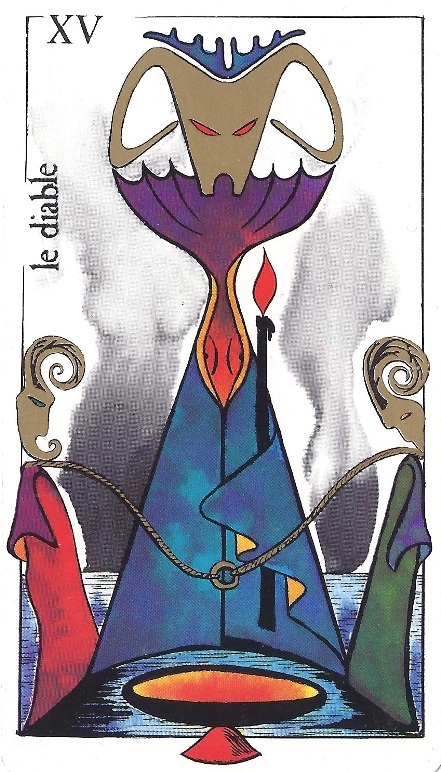 We have wilted leaves, a pentacle reversed - image often associated with the Devil card as well. In the RWS we have a figure weeping over spilled cups, focusing on what is lost rather than what still stands. Cup within cup within cup here, and on top what looks like a kind of egg or perhaps a pineapple. Shall we reach it, crack it open? Or is it too high up? Devil is the tendency to focus on the negative, to get lost in feeling sad; a tendency to be blinded by obstacles; disappointment and resignation, weeping over spilt milk, over things that one may wish would get better but they don't, at least not much. In the second pair we have the Fool as the theme question: Where and how should I be more like the fool, willing to go forward, willing to take risks, willing to have faith and to move forward even if it does mean being bitten in the shins now and again? 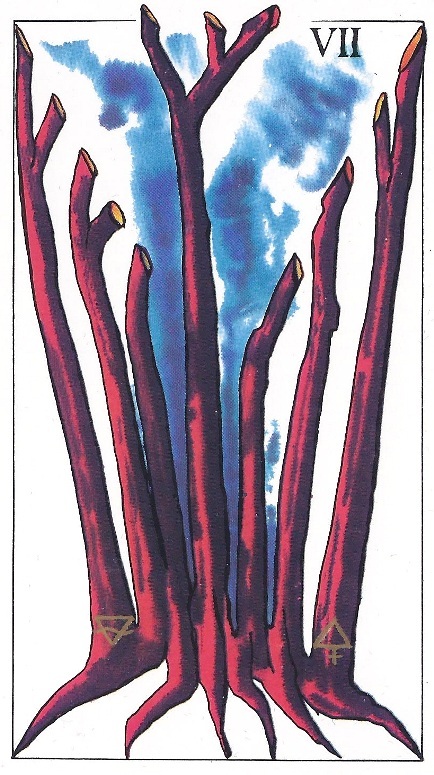 The minor here is the seven of wands, seven wands firmly rooted in the ground stretching upwards, into the sky. 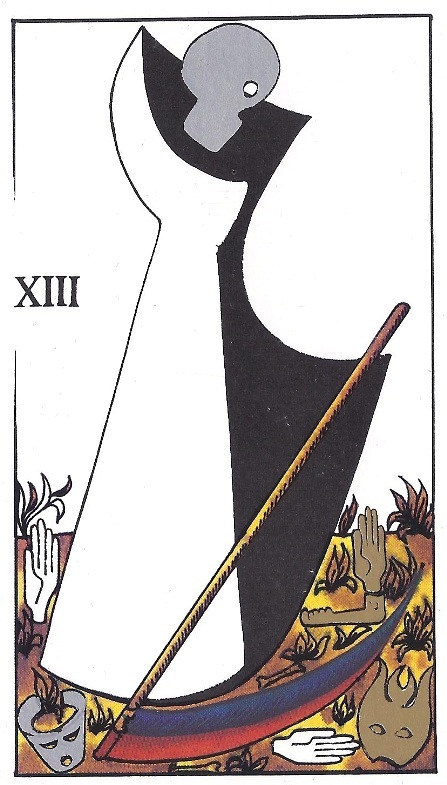 Seven is the Chariot in the major arcana, a card of action and movement and small victories - and wands is the suit of personal growth, of ambition and creative energies. Valour, the thoth says, as as in here shows one powerful rod overcoming and controlling the rest, behind. To be the fool is to take action and take risks, to DO even when the outcome would be far from certain. Face the world and face insecurities and be willing to challenge myself. Our third pair presents us with Justice and the 2 of Coins, two cards that speak well to each other. 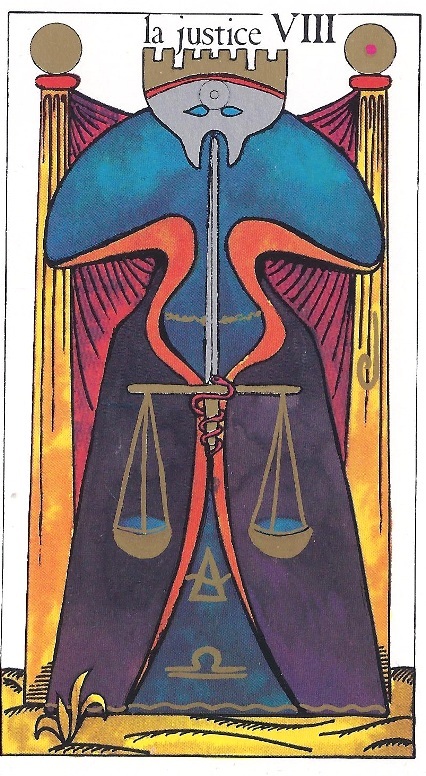 In Justice, with her scales bound to her sword with a serpent that reminds me much of the Caduceus symbol used in medicine, there is the reminder that finding and maintaining equilibrium in life is important even if it isn't a Justice card year for me anymore? And how can I work on channeling this, balance, adjustment as needed. The two of coins, of course. The RWS image of the juggler, keeping the balls in the air with a steady hand: smart multi-tasking, prioritizing, focusing on keeping up with many things at once - and not just the obvious ones like 'x assignment and y application'; taking care of oneself is something that needs to be on the list too. In the Thoth the title for this card is Change, a reminder that life is dynamic, of the need to go with the flow. 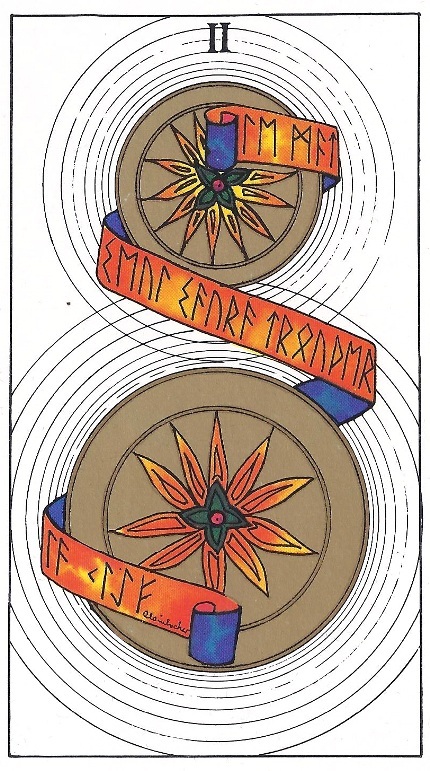 There are runes on the ribbon in this card - we can use them, and cards, and whatever else to help us navigate these twists and turns and that is fine, but do not resist or despair at the unfamiliar, the end of things and start of others. The snake eats its own tail into infinity because such is the universe, hello and goodbye, loss and starting anew. Justice is balance, is prioritizing and juggling and switching back and forth as necessary; it is keeping track of things, not getting over-focused on the one task and letting others fall to the wayside. It is taking her of responsibilities as well as the self. It is working with the changes that may come. Finally we have Death posing a suitably appropriate closing question: what should I let go of, put an end to, cut away? What things have passed their expiration date, their usefulness? Bits and pieces of once nice things lay scattered on the ground here, where the reaper walks and cleans, in his own way. The chariot racing into concrete action is advisable - the chariot racing around in the land of fantasy and dreams, not so much. In the RWS we often see a figure confronted with too large a selection of cups filled with two many things - which to pick, which to pick? Indecision is a a very great shortcoming of mine. Just this Monday I spent about fifteen minutes in the bread aisle while grocery shopping, unable to decide on what to pick to make sandwiches on because SO MANY OPTIONS. Feeling like there are too many options can be almost as paralyzing and difficult as feeling that there are no options at all. What to do, so many things, they spin and how could we grasp at just one, how could we decide? Old things and new clutter together, make a mess, and how can you pick out what it is that you really want, now? In Death we find a need to sort and clear away the confusion, both physically (I have business cards in my wallet of people I no longer even remember at all 0_o) and mentally. In some areas of my life, it is time to step away from the abstract, to sort out a concrete plan rather than just think and dreaming and despairing. In terms of school assignments I would do well by just choosing a topic rather than wasting time that could be better spent on researching going back and forth with 'but i could do this...or This...or That!'. The blade is no worse than the clutter, and the time comes to make use of it, to cut through that fog that can erupt from the fountain of cups. This is the most interesting looking deck! I don't believe I've ever seen it before. Good luck with your new semester!